Locks in moisture for up to 24 hour hydration with 3 essential ceramides to help restore skin’s natural barrier. 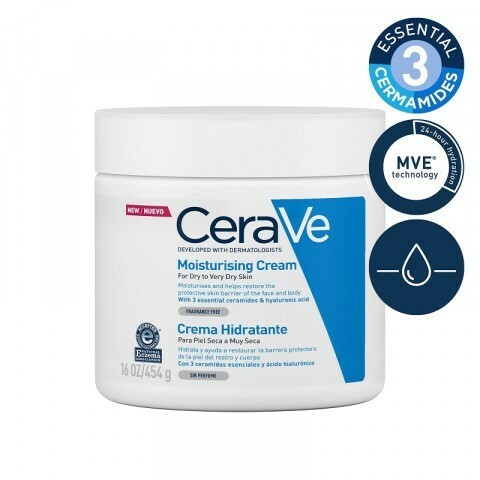 Developed with dermatologists, CeraVe Moisturizing Cream effectively moisturizes while helping to restore the protective skin barrier. 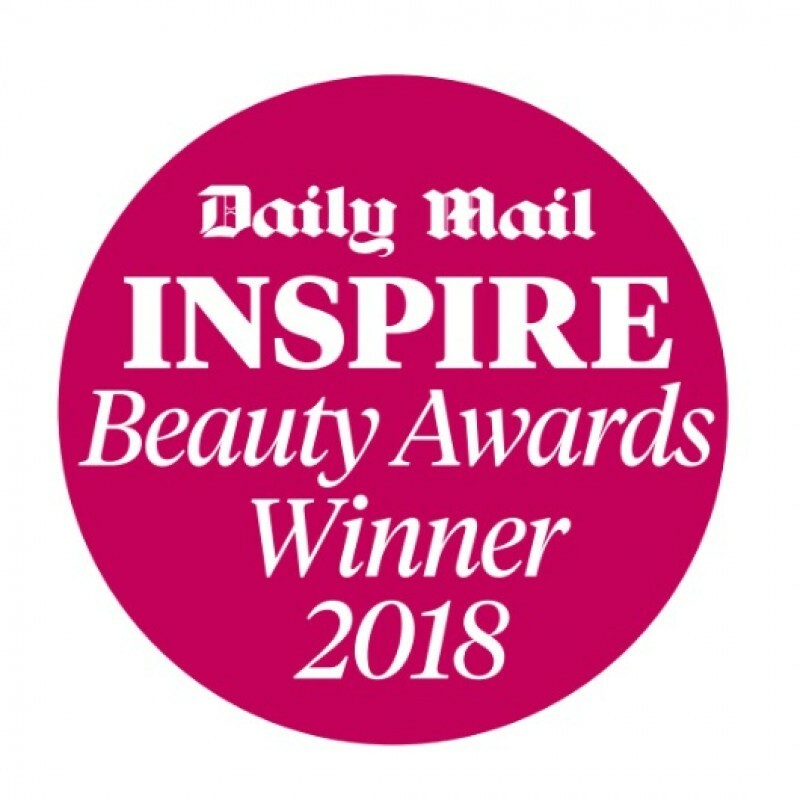 This rich, non-greasy cream, with 3 essential ceramides and hyaluronic acid, provides all day hydration after just one use. Please note: While we try to ensure that product information is correct, on occasion manufacturers may alter their ingredient lists. 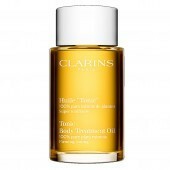 This product is highly moisturising without being greasy. I find it to be very gentle on my skin. It is wonderful for dry patches. I'm easy to irritate and this is great. Love the fact it has no scent. I use this cream and also have the lotion. The tub lasts quite awhile and really soothes. I use it mostly on the body but I do out it on my face when I get dry skin. Good product ! 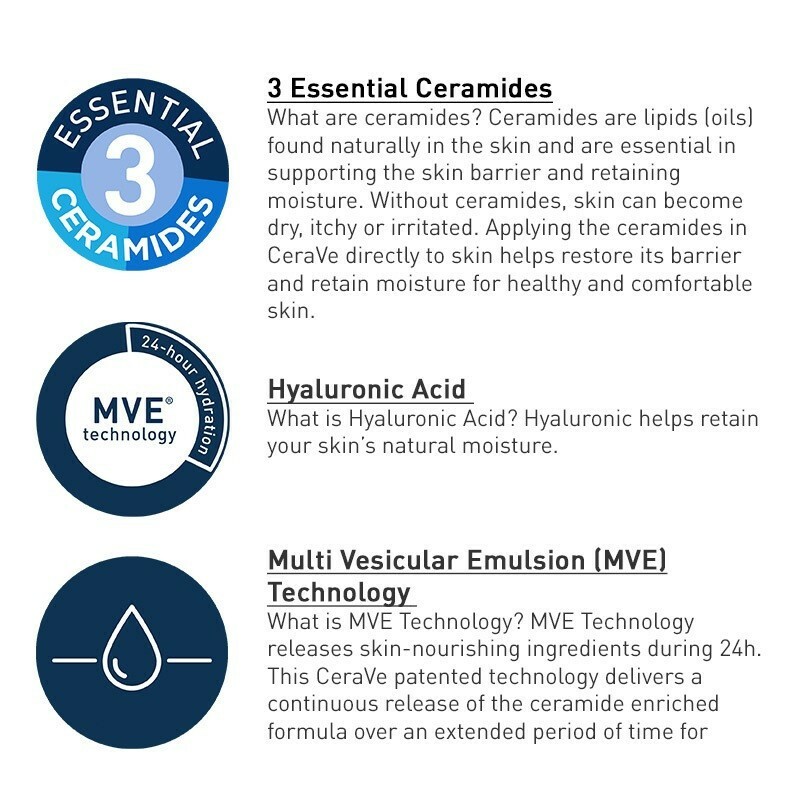 I have looked for a product like Cerave for years! I have tried so many lotions and creams for my dry skin, but all have been disappointments in one way or another. Cerave isn't sticky on application and the main benefit is how it continues to keep my skin smooth and silky. My husband, who is a mechanic, has begun using the cream on his dry hands. I'm really glad I found you, Cerave! Naturally I have oily skin (I know it's for normal to dry skin) but because I wash my face at least twice a day it tends to be normal to a tad dry. I have tried so many different types of moisturisers and never found the right one for me until now. I use this moisturising cream every day whether it's in the morning after I wash my face or at night. I even apply it before I do my make up. Overall, I really love this product!